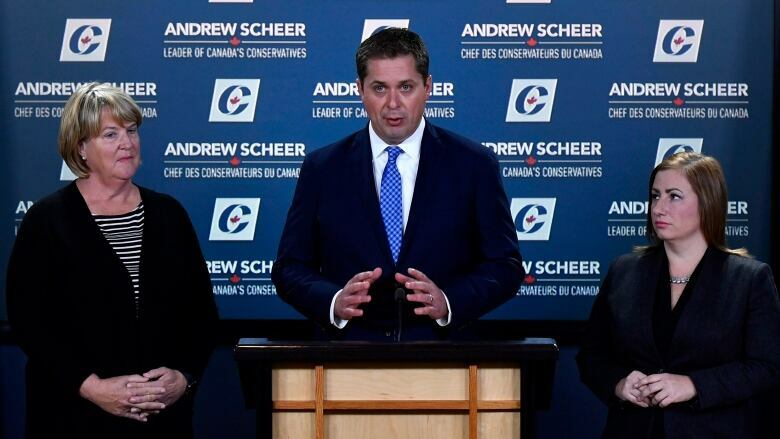 Conservative Leader Andrew Scheer has outlined a plan to jump-start Trans Mountain construction, a month after the Federal Court of Appeal quashed cabinet approval to build the multi-billion dollar expansion project. "This is a rescue plan for the Trans Mountain expansion process. It makes use of every tool the government has at its disposal to get the project back on track," Scheer said. "The quicker they move on this, the better. We'd like to see a fixed timeline." In August, the Federal Court of Appeal found Ottawa's consultation efforts with affected Indigenous groups had been insufficient, and instructed the federal government to pursue more meaningful, two-way consultation with them to ensure their concerns about the project are better addressed. The federal government has a constitutional duty to consult when Aboriginal rights might be infringed upon by development. The court found the government's previous consultation efforts amounted to hiring a series of "note-takers" to document Indigenous concerns. Those who compiled the initial Crown Consultation Report will have to return to those communities to make some court-ordered fixes. Conservative MP Cathy McLeod, the party's Indigenous affairs critic, said a special representative could be leading those efforts right now — meeting with bands like the Coldwater Indian Band in B.C., which has said the project's route poses an unacceptable risk to the sole source of drinking water for 90 per cent of people on the reserve. "The First Nations along the route that have concerns could be consulted right now," she said in an interview. "Obviously if there is any risk ... they could have conversations about rerouting the pipeline." While the Liberal government outlined last week how it planned to address another problem flagged by the court — the fact that the National Energy Board did not assess the impact the pipeline would have on coastal waters and marine life — it has not yet said what it plans to do to breathe new life into the Indigenous consultation effort. Natural Resources Minister Amarjeet Sohi said Monday the government will be announcing its Indigenous process "very, very shortly." "We have some work to do and we are just finalizing the details of the next steps and we will be announcing them shortly," he said. "Our goal is to make sure whatever the next steps we take are the right steps and that they enable us to engage in a way that will get us to the outcomes that we think are appropriate." The government has imposed a five-month timeline on the NEB-led assessment of the project's marine impact. A timeline for new Indigenous talks is still uncertain. The Liberal government, which completed its $4.5 billion acquisition of the existing pipeline in August, has vowed to build the expansion project, saying it is in the national interest. But Scheer said Monday the Liberal government, by ordering the NEB to re-do part of its initial environmental assessment, is simply add more layers to the process. He suggested the Liberal government should accept Transport Canada's existing analysis of the project's impact on tanker traffic as sufficient. The court said the NEB did not adequately address what impact a substantial increase in tanker traffic could have on the endangered southern resident killer whale population in those waters, or the potential impact of a diluted bitumen spill from tankers. If built, the expanded pipeline will carry an estimated 890,000 barrels a day — tripling the line's existing capacity — and increase traffic off B.C. 's coast from approximately five tankers to 34 tankers a month. Scheer also said the government should support a Senate public bill, S-245, introduced by Independent Alberta Sen. Doug Black, which would clarify that the pipeline falls under federal jurisdiction. Scheer also outlined other initiatives he would pursue, if elected, to shore up the energy industry. He would start by repealing Bill C-69, Liberal legislation that is currently before the Senate. The bill has been a lightning rod for oil patch boosters who say it vests too much authority in the hands of Environment Minister Catherine McKenna to approve or deny a project, rather than the experts who carry out impact assessments. The bill has been criticized also for making a change to the rules on who can voice concerns about a natural resources project. Under the current NEB regime, a person must apply for "standing" before being allowed to testify before a review panel. Bill C-69 would allow greater access for members of the public, environmentalists and Indigenous groups. Scheer said this opens up the process to "foreign-funded interference," suggesting green activists are bankrolled by foreigners intent on opposing Canadian resource development at every turn. He also said a Conservative government would repeal Bill C-48, a piece of government legislation that imposes a ban on tanker traffic along B.C. 's north coast. The legislation was introduced after the Trudeau government cancelled Enbridge's Northern Gateway project, which would have carried diluted bitumen to a terminal in Kitimat, B.C., for export to Asia. Scheer said he would also repeal the planned federal carbon tax.